CELEBRATING 28 YEARS IN 2016! We receive many requests for club members to attend all sorts of events including car shows, benefits, business functions, non-profit events, church events, school events, etc. We also receive requests to lease or rent vehicles for birthday's, weddings, proms, special occasions, etc. The purpose of this webpage is to help you understand the process of requesting members vehicles and how members respond to your request. Firstly, please understand that members vehicles are their personal prized possessions. Their vehicles are old and require lots of maintenance and care. Members also incur cost's to travel to the many events they attend. Weather also plays a big part in their decisions to attend events. The heat and cold affects the members as well as the cars. Members rarely just park and walk away from their vehicles. They stay near them to prohibit children and adults from touching, climbing in or on or in any way damaging their pride and joy. It is every members choice to attend any event or function. Members are not obligated in any way to attend any event or function even if they expressed interest in attending any event or function. 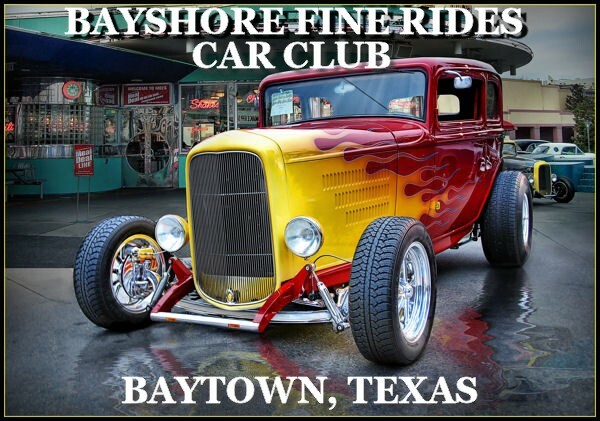 Bayshore Fine Rides, Inc. is not responsible for members attending any event or function. Request will be posted on this page. If a member is interested in your request, they will contact you on their own. If you do not hear from any member, it simply means they are either not interested or they have something else planned on the day of your request. Requests should be emailed to admin@bayshorefinerides.net . Your email will be posted below. Please be sure to include the reason, time, date, location and the name and phone number for the person to contact. Good afternoon! I am writing you in regards to your car club. I am the Manager here at Eagle Drive Storage. Mr. Dennis Lazard is a tenant here and I approached him about your Car Club possibly holding a car show here at our property. I would love to have y’all here on any Saturday in the month of August. We will have hot dogs and cold drinks for everyone. He said for me to send the email in with the request so that it can be brought up at your meeting the last Thursday of this month. We are very visible to FM3180 and always have a lot of traffic so I’m sure the cars would bring a lot of attention! Thank you for your consideration! I look forward to hearing from you. Have a wonderful day! I am Krystal, I met Randy Cernosek at the car show at the San Jacinto Mall last month. We had spoken about a "sock hop" at the Stratford Library in Highlands, and y'all providing some cars to contribute to the atmosphere. We have space for about 3 cars, and cars that are from the 50s-60s are preferable for a more "sock hop" feel, but we will be grateful for anything y'all can provide! The date is Wednesday July 20 at 2 PM. Please let me know if you are still interested and if this works for you. My name is Juan Gonzalez from Austin, Texas. I need help, My parents are renewing their wedding vows on June 12th on the Beach in Rockport. We're looking for someone that owns a 55 Chevy who could drive them from the hotel to the ceremony. I think the drive is less than 10 miles. If you know someone who would be willing to do this for us, please have them contact me at 512-415-5162 or by email juang2008@att.net Date is Sunday, June 12th, ceremony starts at 11:00 so need pickup at 10:30. We would like to have your group come do a car show at our church on Father’s Day June 19. It would be pretty informal, not necessarily for competition… Could you get me some more information on how to plan the event? Could we possibly meet up sometime? Car shows, games, events and door prizes. Hello, my name is Elaine Lewis, I own a store in Bay City, Texas. We are located on the Historic square. The merchants are hosting a "rock the block" party September 10th from 5-7 p.m. We would like to invite your club to participate, the stores will be serving root beer floats and offering discounts. We will have food trucks and entertainment. Matagorda county is proud of our beaches and have great fishing, maybe you can make a weekend of it. My store no. is 979-943-3363 and my cell 832-597-4080. Please call to confirm. Thanking you in advance. Hello, I received your contact information on the Classic Chassis Car Club website for Houston, TX . I'd imagine all of the cars represented through your club are privately owned, but I wanted to know if any of the members rent their vehicle for photo shoots. I'm looking for a 1960's convertible of any make/model for June 14th in the afternoon for an hour max. I'm not looking to drive the car nor move it from the property, just as long as it's in an open drive way. Please let me know. Thanks, Brittani Perry 713.245.0273. Hello, My name is Nikisha Goode and I am putting together a parade for my vacation bible school it will be held on June 6,2015 @ 11:00am the starting point will be at Northshore High School 13501 Holly Park Houston TX, 77015 to 1010 Freeport Houston TX,77015 which is the church location. I am looking for art car clubs and motorcycle clubs to come out and join us as we make some noise for JESUS and get the community involved. I was told that you have an event page that I may be able to get the message out, but I am not really good with the computer so I was trying to see how I could get the word out could you please help me or direct me to the best help my church name is East Houston Trinity Walk of Faith. If you have any question are need more information please contact me at 832-883-6982 or email me at ngoode25@gmail.com thanks and have a blessed day.